Mystery Painting. Is it of Lauterbrunnen? Spotted a picture on your website. 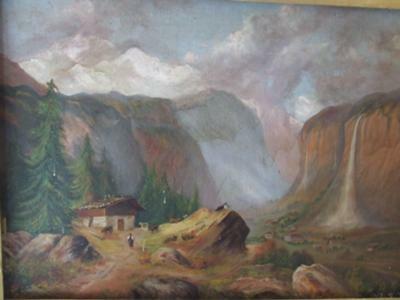 I am so sure thanks to you that I have finally found the mystery location of an old painting that has been in my mothers family for years. They migrated to Australia in 1855 from Hallgarten in the Rhinegau (then Prussia). Curiously, one sister of my great grandfather supposedly ran off with an Italian, was disowned, sailed for Italy, the ship sank, and she was never seen again. Quite a story! Last year my dogged research found out the truth..she married a Swiss man, not an Italian, they moved to Maryborough in Queensland and they had one child. However their trail ran cold until I went to see an exhibition of Eugene Von Gerraud in the Queensland art gallery last weekend. There was a work bearing a striking resemblance to my mothers old painting. It was of Terni, in Italy, and my google search has now led me to Lauterbrunnen! There is no one alive in the family now who can say for sure, but I am so excited to think what looked so fanciful to us all is actually a real place !! What do you think ?? Am I right? ?